I really do have a love-hate relationship with running, I started writing before my last marathon on Sunday 12th April. I promised many that I will never a run a marathon again and that little voice in my head is already telling me it is a lie! In truth I will never stop running, my love for running started at school, cross country running, back then I knew one day I would run The London Marathon. It was one of my dreams alongside my close school friend Daniel Juett, to my knowledge he has never run a marathon. During my teenage years, I put on a lot of weight and lost my desire to run. My manager at Alive Toby saw an old picture of me, and his comment was that I was a right burger! My desire to run returned in 2006, my long term relationship to Shawn ended and I saw a poster in Prince Regent Gym to run the London Marathon for Mencap in 2007. I pledged to raise £2500 for Mencap for my place in the London marathon. I thought myself to be in good shape and the idea to run a marathon was a welcome distraction of my broken heart. When you enter a marathon you have to put the miles in, I joined the Brighton Shop Jog runners every Sunday for a run, and I would go running on my own when I had the chance. This is when I learned how much I really loved running if I was ever down I’d go for a run, while running I would forget my troubles, some would say running away from my troubles. I completed the London marathon in 2007, hitting the walk around the 18-mile mark when you hit the wall it is hard to find your feet to run again. My ankles were caked in blood, I used to have a habit of kicking my ankles whilst running, a habit that I thankfully kicked out of. I completed the London Marathon in 4hrs 46mins 55 seconds time that I would beat myself up on for years! Everybody knows the story that I didn’t raise the £2500 for Mencap, so I felt a bit of failure and put in over £800 of my own money to make it up. After the London marathon, I decided that I didn’t want to run anymore; then I got an email regarding the New York Marathon for CF Trust. CF Trust is Cystic Fibrosis and one of my friends Mikey suffers from this condition and I wanted to do it for him. This time I wanted to do it properly, I wanted to follow a strict plan and this time make sure that I would complete the New York Marathon without hitting the wall. So I slipped on my running shoes again 4 months after I said that I wouldn’t run again. So as a part of my training, I decided that I needed to run as much as I possibly could, I entered the Hastings Half Marathon on Sunday 16th March 2008. The week before the Hastings half marathon I had a cold, at the time I didn’t think much of it. On race day I felt alright, although I text a number of people saying something wasn’t right, and that I would text them after the race. I never sent that text because that day my life changed, I collapsed at the finish line and had a cardiac arrest. If you think about it running saved my life, I have a condition where it is common to die in my sleep. My condition decided to show itself on a day that I was running, a day that defibrillators were at hand and that I could be saved, so yeah running saved my life. I was then diagnosed with a heart condition called Brugada Syndrome, doctors/ cardiologist/ specialist said that I would never run a marathon again. It was tough to take in, the idea of not running again, even though I came away with my life. I wouldn’t run again until 2010 after some support from Myheart crew I finally found the courage to put on my running shoes again. It did take a lot of courage to put my running shoes on again, I had a cardiac arrest whilst running, and I feared it would happen again, that is a hard hurdle to climb over! I never knew how far I should or could run; no-one would/ could give me those answers. My burning desire to run another marathon returned in 2014 when I volunteered to cheer on C-R-Y runners during the Brighton Marathon. So with my mind made up I decided to sign up for the Brighton Marathon, I was honest when filling out the application, a part of me wanted them to refuse me entry for the marathon. They took my money and I was really doing this marathon, though I had decided from the beginning if there was any incidents or warning signs I would pull out of the marathon. My first challenge came with the Spartan Race in October 2014, the main challenge was getting permission from my cardiologist, without permission C-R-Y wouldn’t allow me to take part. Thankfully my cardiologist gave me permission to take part, though he said if it was a marathon we really would need to talk he commented at the time, I just kept quiet! The Spartan Beast Race is a 20km obstacle race, which we also had to wade through water and mud. I found this event to be more gruelling than a marathon, so I began to build in confidence towards my challenge in 2015. The Spartan Race also saw an end to my running shoes, the very shoes that saw me through the London Marathon and the Hastings Half Marathon, it was sad to say goodbye to them. A little break after Spartan Race I purchased my new running shoes, I would then step up my training for the Brighton Marathon, I wanted to run without hitting the wall. Unfortunately, my training didn’t go to plan, having a condition I have to listen to my body, so if I felt unwell I would take a week break from running, minor injuries that included tight hamstrings and shin splints slowed down my training too. I had my pacing test in February and nothing showed up during The Spartan Race or on any of my running days, so that is when I decided that I would be really doing this! 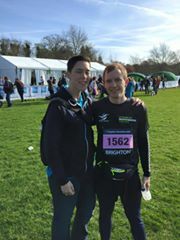 Saturday 11th April 2015 a night that I won’t ever forget the night before the Brighton Marathon, I am being very generous by saying that I had 3 hours sleep the night before the marathon. I had run many miles before the marathon day, but I did have a fear that this would really be my last run. I felt bad because my sister was pregnant at the time and I felt that maybe I was being selfish. I also had my parents in a tailspin not wanting me to run this marathon. I had to do this for myself, though I really wasn’t sure what I was trying to prove. That night I talked myself out of running a million times, and yet I laid in my bed until my alarm went off, though I really didn’t need it! I was a bag of nerves all morning, my poached eggs on toast were a struggle to eat, the toast dry which wasn’t pleasant to eat with a dry mouth. I then showered and got changed into my running gear before I had the last of breakfast a bowl of porridge, which went down better than the eggs and toast. I packed my little bum bag with 3 clementines and 3 nakd bars, this was the fuel that I had trained with. This time I trained without running gels, they taste horrible and I wanted to know what I was putting in my body! I walked to Preston Park starting point of Brighton marathon, on the route passing so many people that were on the same path as me, yet a very different journey. At Preston Park I waited around anxiously until Charlie Elford and Dan turned up, Charlie hugged me and could see that I was shaking controllably, I think this caused a moment of concern for Charlie. They called us to line up for the marathon, I had one last pee by this point I had been to the toilet 5 times already. I then lined up with all the other runners, my nerves building up more than ever, I knew once I start running that I would be fine, it was just the waiting. Once I started running I knew that I would be fine, I had felt fine all the time, tired due to lack of sleep but fine. The first mile in and I had to go pee again, the rest of the run I managed to keep my bladder under control. I high fived Tony Hawkins on London Road, though I don’t think he remembers. I loved every single minute of running, through the city that I love, the place that I now call home. What also felt good was all the people that I was overtaking, damn that competitive side came out of me! I was doing a good time, Charlie informed me that at one point it looked like I would finish in 3hrs 45mins. Around the 17-18 mile mark I started thinking to myself I’m going to get around this course without hitting the wall. Sadly I got a bit ahead of myself, even before the race I had a mental barrier of 18 miles ‘cause that is all I had done in training. 19-mile mark my legs gave in and I had to start walking, I text Charlie to let her know, from this point forward I would walk 5 minutes and then run 5 minutes. The 5-minute runs felt like the longest run in the world, and the walking time went far too quickly! The run along the seafront was hard, the crowds were big and when you get people cheering you on, you want to keep on running and not slow down to walking pace. I completed the Brighton Marathon marathon in 4hrs 28mins and 43seconds which is 18 minutes faster than my London time in 2007. I have made a promise to my family and friends that I would never run a marathon again, I’m unsure how true I will be to that. I have no intentions to run a marathon again, I just may get that itch, I need to avoid Brighton marathon weekend. I think Charlie was amazed that I got around, she even feared the worst when she saw someone get stretched at the finish line. I want to thank everybody that sponsored me during my run, it really means a lot to me. My main charity was The Royal Marsden Cancer, I chose this charity because in 2010 I lost one of my childhood friends Stuart Chestney to cancer. When I found out about his passing, I wanted to do something in his honour, he was one of the sweetest guys you could ever meet. Life is not fair, and all we can do is play with the cards we’re dealt with, some people have used the words that I’m an inspiration, I’m not, I do what I do because that is what I do! I wish I had raised more money for this charity, end of the day I can be proud that I completed the Brighton Marathon, something my doctors said I would never do and I’m glad I did it for Stuart. I want to thank Charlie for being there on the day, and Matthew for meeting me at the finish, Kylie, Rob, Diana, Austin, Dan, Alex and all the other people that I saw on the day. Thank you for the continued support from everyone at Alive Fitness & Natural Health, thank you, Benny, for the PNF stretch after the race. The things I hate about Running! The training, people do turn up at marathons without training, but I would never advice that you need to know if your body can do it and prepare the body for it. Runner etiquette, the having to smile or nod at all other runners (Runners acknowledgement, yes I’m a runner! ), one time I had a guy try to high five me! I just want to run, I don’t want to smile or nod either, but it really bugs me when people don’t follow the runner etiquette. Traffic lights, I hate having to stop whilst running, so I jog on the spot waiting for the green man. The injuries, the tight muscles after a long run. People especially when running towards people, they see me coming can they not step aside, of course not I have to run around you…Cunts!!! Other runners, the ones that run past you with ease, though on the flip side that sense of joy when overtaking someone.